Several years ago while consulting a business, we dug into their books to assess their financial health. Like many businesses, they experienced a seasonal drop in revenue during the summer although their main expenses of rent and payroll remained constant. After further exploration, we learned of a loan they had taken out several years prior that had a balloon payment due during the summer. This large payment would coincide with the lowest point of their cash reserves. This business, like many, had failed to maintain a clear cash projection. The lesson was that your business may be able to handle debt, it may be growing with great revenue but if you run out of cash the doors close. At this point, it was necessary for the business to get a cash injection to stay afloat, a scenario that is common for startups and small businesses alike. As part of helping them to recover from their near closure and to help them avoid this problem again, the first step was to create a clear cash projection. Many business owners get in their head that as long as they maintain a 10k or 20k balance in their checking account then they will be in good shape. While this type of reserve may be fine for your household expenses or for periods of steady profits, a static number doesn’t take into account the business growth or periods of fluctuations. 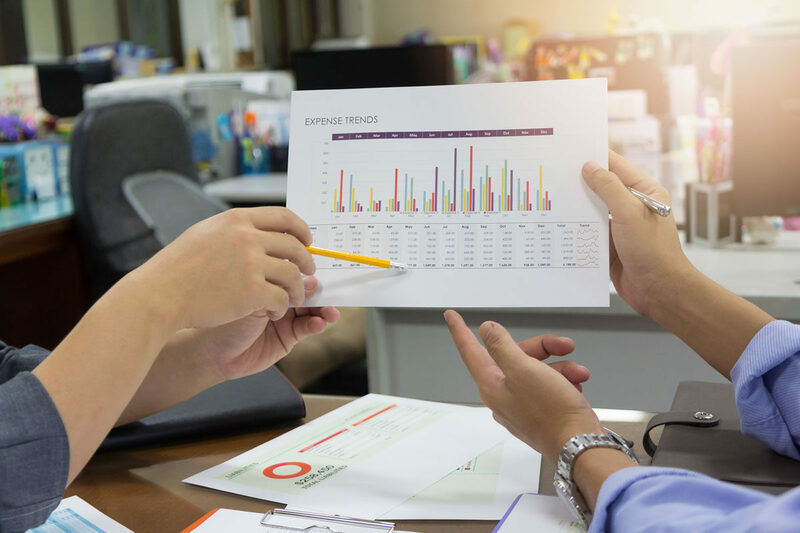 It’s not enough to create an annual budget, even if you stick to that budget because even though your business may perform to those numbers on an annual basis there could easily be huge fluctuations during the year. A monthly forecast or projection of your cash is imperative to provide you with a business dashboard. Using this projection you can begin to make business adjustments before it’s too late. Much like a sailboat that has to change course, a slight turn earlier in the journey will be an easier route than making a hard turn at the last minute. Putting together and maintaining a cash projection is easier than you think. If you would like a free template or help to put one together Cultivate can help. Step 1: Begin with your annual budget. The easiest way to create a budget is to start with your prior year income statement. Go through each expense line of that income statement and readjust it to what you think you will spend on that area in the coming year. For instance, if your rent increases by 5% then increase that accordingly. If there are certain expenses that you can eliminate then drop those out. If your business doesn’t have a year of financial history then download our projected expense list template. You can adjust the numbers for each account but it will help you to consider business expenses that many entrepreneurs forget when planning their costs. Step 2: Separate on your budget the expenses that vary significantly from month to month. By doing this you can determine a base budget of your ongoing monthly expenses from the expenses that will vary substantially from month to month. In most of my businesses where staffing is my greatest expense, I pull the payroll and contract labor out from the base budget. By breaking apart these regular from the fluctuating expenses we can put together a monthly forecast. Step 4: Now that you have a decent view of your expenses, create a row on the top of your cash projection for your revenue. In my business, we have certain customers that pay us annually for a subscription, some pay quarterly and some pay monthly. We also have projects that are substantial one-time revenues. To keep track of all this I suggest a separate tab that lists all of these out by month and then reference these totals on the cash projection tab. Step 5: Now that your cash projection shows your expenses and revenue on a monthly basis, you can sum them to reflect your projected monthly profit or loss. Pull up your balance sheet or checkbook register to get your starting cash balance and plug this in at the top of the sheet. Simply add to that the expected revenue for the first month of your projection and subtract the expenses and that will be your expected cash at the month’s end. Repeat that formula by taking the expected cash at the end of each month and adding the revenue and subtracting the expenses. If you are a sole proprietor or pass thru LLC that takes a draw against your profits then make sure to subtract that too. At the end of each month once the books are closed you can adjust the cash projection by overwriting the projected revenue, expenses, draw and ending cash balance with the actual numbers. As changes occur such as a new recurring client or project won, you can simply add this to your revenue section and your cash projection will reflow accordingly. The same is true if you increase or decrease expenses. In the earlier example where I suggest breaking payroll apart from the base expenses, I do this so I can easily model what-if scenarios for my staff. If I add to or subtract different staff expenses I can quickly see how that will impact my cash position.